Week 7 Opponent's schedules - Win vs Wyoming!!! Chawan Cut compiles the news from KITV and KFVE. Coach Mack talks to KITV about the team's goals (a lot of the quotes are in the HawaiiAthletics video). KFVE talks to Malcolm Lane and Rocky Savaiigaea. From the UH Athletics website. Following the team’s first bye on Sept. 26, UH is back on the road for its WAC opener at Louisiana Tech on Wednesday, Sept. 30, a game that will be nationally televised. The WAC is planning to announce the complete national television schedule on Wednesday. I also updated the schedule on the right. HawaiiAthletics.com has posted highlights and interviews from yesterday's practice. Interviewees include Greg McMackin, Rocky Savaiigaea and Greg Alexander. Jason Kaneshiro reviews yesterday's practice. With the bitterness of season-ending losses to Cincinnati and Notre Dame still lingering for some Warriors, the first of 15 spring practices was devoted primarily to fundamentals and position drills. UH head coach Greg McMackin said tomorrow morning's practice will be more of the same, with the team scheduled to put the pads on and get into team situations at Saturday's session. "It's definitely exciting to get back out here and play some real football again," quarterback Greg Alexander said. "I was excited for it. It's a long layover, a long time to think about some games we let slip away. "There were a couple games that sit with you. You still think about those now and then so we have to fix our mistakes." Stephen Tsai has a report with a bunch of news and notes. In the 15 practices over the next four weeks, the emphasis will be on perfecting techniques and reducing mistakes. "We can't have personal fouls," McMackin said. "We had too many last year. That's laziness, and a lack of technique. We've learned from last year. We're going to get better." There's also quotes from Inoke Funaki, Leon Wright-Jackson, Malcolm Lane, Aaron Kia, Rocky Savaiigaea, Jovonte Taylor, Jake Heun and Vili Nauahi. Brian McInnis talks to the new coaches, Gordy Shaw and Chris Tormey. "When you've been doing it for as long as I've been doing it, my favorite saying is, 'Never rate potential over performance,'" said Shaw, a former center. "So, you might have a world of ability, but it's still about what you do out here between the stripes — that ends up being whether you play or not. And Dave Reardon writes a Further Review column about the practice. This year, it seems more like things are on a schedule that makes sense. Will that translate into an improvement on last year's 7-7 record? Only with a major upgrade of offensive line performance, and if the defense can be rebuilt (especially a secondary that lost nearly everyone off the two-deep chart). Five minutes into the first practice, and McMackin's voice was already hoarse. There's even more teaching going on than usual with so many new players. The coaches need to figure out quickly who they can count on in the fall. Rocky Savaiigaea said there's no easing in this time. "This was the hardest first day we've ever had, very intense," he said. Chawan Cut is back compiling the news! First video has KGMB's Liz Chun reporting live from the field and interviewing Greg Alexander, while KITV's Robert Kekaula interviews John Estes. KGMB's website also has an interview with Coach Greg McMackin from the top of their broadcast. The second video has KHON's John Veneri interviewing Coach Mack, and KHNL's Jason Tang interviewing Coach Mack...twice! Practice starts at the top of the hour. Dave Reardon writes that he'll be tweeting from practice. Here's his Twitter page. I'm sure Stephen Tsai will have reports from practice as well. Check the Warrior Beat or his Twitter page. And be sure to check the message boards too: SportsHawaii and WSN. I'll be linking to updates. UPDATE: Not much going on, but HawaiiAthletics (via Twitter) has an update. Good turnout for 1st day of practice. All 4 stations and both papers. 100 fans here. UPDATE 2: HawaiiAthletics.com has a report from today's practice. Caught the last hour of this afternoon's practice. Watched mostly the OL practice under new assistant Gordie Shaw. Came away impressed with Shaw. Good technical instructions...and good communication with players. Also some new pass pro drills. Caught a little of the DL pass rush drills. DTs Rocky Savaiigaea, Tuika Tufaga, Vaughn Meatoga along with RDE John Fonoti stood out. Good to see Rocky & Vaughn helping JC DT newcomer David Hafoka adjust to new DL drills. Came away impressed with redshirt frosh DT Haku Correa...good interior quickness and handwork. Also happened to notice incoming frosh DL signee Marcus Malepeai (Radford) observing the DL drills. UPDATE 4: Jason Kaneshiro has some news and notes from today's practice. >> After warmups, the entire team spent the first period of practice working on form tackling. Wednesday’s emphasis will be on shedding blocks, with turnover drills on the agenda for Saturday. >> The quarterbacks appeared on target for the most part with Greg Alexander leading the rotation. Five-foot-eight slotback Dustin Blount made a nice leaping catch over the middle during drills. “Now I know the offense. I’m looking at the right things, things are slowing down and I know where I want the ball to go,” he said. Dave Reardon has some notes as well. Today's the day, first day of spring practice, woot woot! Stephen Tsai talks to Greg McMackin about the depth chart going in. Head coach Greg McMackin said the Hawai'i football team's depth chart entering spring training is "a starting point" and that "nine-tenths of the (starting) jobs are open." I assume that everyone (listed as a starter) will work hard and maintain their position. But if they don't prepare themselves, we'd play the best player at that point in time. We're committed to playing our best players." After spring training, another depth chart will be posted. "New starting points," McMackin said. Jason Kaneshiro interviews Ron Lee about the offense. After a 7-7 season, this year's Warriors again have holes to fill on offense as they hold their first practice of the spring this afternoon. But experience at key positions allows them to start farther along than they did last year. "It's so different this spring," Lee said. "The goals are a little different." While Lee plans to use the spring to refine the passing attack, it's also a chance to experiment and look at players who waited their turn last season. Dave Reardon profiles early-enroller Billy Ray Stutzmann. Stutzmann also figures to benefit from regular weightlifting sessions he might not have been doing if running track at Saint Louis. He's added 12 pounds of muscle to his 6-foot-1 frame and figures to check in at around 170 today. "I just think it will really help me down the line, being here, maybe in a few months," says Stutzmann, who had his first UH class in January, a couple of weeks after turning 18. "It's always been my goal to get playing time as a freshman, but if the coaches want me to redshirt, I'm fine with that." Practice is from 4pm to 6pm HST today. After falling behind 20-6 early on, former UH QB Shawn Withy-Allen rallied the Fayetteville Guard to a 57-32 win over the Carolina Speed to up their record to 2-0. Withy-Allen was 17 of 23 for 281 yards and five TD passes. Thanks to fuzzylogic. 1. I put a thumbnail of the spring practice schedule at the top right. Clicking on it will take you to the Star-Bulletin's full-sized schedule. 2. Made some changes to the banner. 3. You can reach this blog using uhfanblog.com. Less typing! 4. I have a Twitter page, but most of what I write is nonsense. So about the same as here. Spring practice starts tomorrow. Stephen Tsai has detailed breakdowns of each position and talks to Greg McMackin about his philosophy heading into the new year. That passive-aggressive offense that went through several transformations last year is going back to the original air-it-out model. Greg McMackin, who enters his second spring as UH head coach, also promises to roll out more attacking schemes on defense and special teams. The approach is as basic as taking the SAT: Go with your first answer. And McMackin, whose promotion was based largely on the thriller instincts he relied on as a decorated defensive coordinator, is returning to a philosophy he knows best. "We want to attack in all three phases," McMackin said. Q: With a new offensive line coach, is the spring even more critical for the line? A: I love the confidence of Gordy Shaw. We just met on our entire personnel today and he sees so much potential. He's a positive guy and he sees so much potential with our offensive line. He is really excited about coaching these guys. He's an outstanding coach and he likes the guys we have. You'll never hear an excuse out of him. We've worked hard at getting our protections and everything together with our schemes. It's just a matter of teaching, and he's a great teacher. The article includes a spring practice schedule and positional breakdowns. But speaking of the o-line, Dave Reardon has a column about all the different coaches the offensive line has had in just the past few years. Counting Cavanaugh, the man for whom they committed to sweat, bleed and play, the fifth-year year seniors taking the field tomorrow on the first day of spring practice are on their seventh O-line coach. Of all the units in football, the offensive line requires the most cohesion. It takes a tough and experienced coach to ball those five fingers into a fist. Some guys can impart knowledge but not motivate, others are the opposite. In addition to shoring up the offensive line, Ferd Lewis writes that reducing penalties is a top priority. But tackling the propensity for penalties, especially unsportsman-like conduct infractions, is something different. The problem there isn't a technique that must be overhauled as much as a mindset that requires changing. And it starts with the head coach putting his foot down on the issue — and keeping it down. That's something we didn't always see last year. And KHON's Kanoa Leahey has part two of his interview with Coach Mack. Associate head coach Rich Miano shows off the UH Athletic Department's refurbished and redecorated reception area. That's a nice H-rug. "Most players will get mad or frustrated, but I love it, because it's always keeping me humble," Bess said before the Make-A-Wish banquet. "Knowing that there's always someone out there to knock you down. In this league, you can never be satisfied. There is always room for improvement." Bess said he wants to get better in every aspect. "There were a couple of times last year that I dropped the ball," Bess said. "There were a couple of times that I misread a coverage, and ran the wrong route." Still, Bess said he takes "a lot" more confidence into his second season. And Miami may be drafting another Warrior this year. Alain Poupart of Dolphin Digest writes that the Dolphins met with Veikune recently and may draft him to play outside linebacker. The 6-3, 255-pound Veikune is rated as the 10th-best defensive end prospect by Scout.com, but at his size, it's as an outside linebacker that the Dolphins would consider drafting him. A second-team All-WAC selection in 2008 after recording nine sacks and three forced fumbles, Veikune is projected as a second- or third-round pick. Barring a Dolphins trade, they currently hold their 25th, 44th and 56th selections in the draft, and Veikune projects most closely to the No. 56. Miami's fourth pick is No. 87 overall, but Veikune figures to have been drafted by that point. Ferd Lewis writes that the WAC is waiting on ESPN to complete the conference schedule. Whether the University of Hawai'i's football game at San Jose State is moved to a Friday to accommodate ESPN is one of the remaining pieces of the puzzle to be resolved before the Western Athletic Conference announces its 2009 schedule. People involved in the process said they expect the schedule to be released before the end of next week. The San Jose State game — probably in either October or November — is said to be one of six TV possibilities for the Warriors still under consideration. "That's one of the games still being discussed," said someone with knowledge of the situation but who has declined to be identified because negotiations are on-going. WAC associate commissioner Jeff Hurd said he believes UH will "likely get two to four" games on ESPN or ESPN2. There are additional possibilities on ESPNU. UH is hosting its first "Junior Day" in conjunction with the final day of practice. High school coaches were asked to nominate their top prospects to attend the event on campus. McMackin expects to draw between 150 and 200 players and their parents. "On the mainland they do this; we've just never done this here," McMackin said. "We're trying to stay on the leading edge of recruiting. "Recruiting is such a year-round, full-time deal. We want to get out of losing nine guys (on offense) last year and nine guys (on defense) this year. We're working really hard to recruit year-round and get the right guys and do it the right way." Washington Post blogger Jason La Canfora writes about Colt Brennan possibly getting a chance to back up Jason Campbell this season. Why do I have the feeling this battle might inflame more fan passion than any other? Well, perhaps it was because Colt Brennan may have generated more buzz than any player in the NFL who never came close to getting a snap last year. The rookie, inactive as the emergency third QB all of last season, flashed a few things in preseason and by August the cries from fans for him to unseat not only backup Todd Collins, but starter Jason Campbell as well, made for one of the summer's most interesting sideshows. To me, rushing Brennan in any manner made no sense then and still doesn't, but he will certainly get more time to show his stuff in preseason games this summer and could push Collins. Brennan should get more of a shot to work with NFL-caliber players, but that also means he will be working against legitimate defensive players, and that's where some of his shortcomings could be exposed. He may not have the mechanics of a prototypical NFL quarterback, but he has plenty of moxie and playmaking instincts that might carry him at this level. UPDATE: KHON interviews Coach Mack, who talks about Greg Alexander entering spring at #1 QB and Inoke Funaki playing running back, Wildcat QB and slot. The upcoming UH coaching clinic is also mentioned. Thanks to fuzzylogic for finding the vid. Jason Kaneshiro takes a look at some of the players who may be limited in spring practice as they recover from injuries. Soares suffered a lower leg injury early in fall camp last year and missed the entire season. "I've talked to the trainers and the doctors and he's not going to be ready for spring," McMackin said. "They're hoping after spring he'll be ready to go, but we're not going to take a chance on hurting him." McMackin said Falemalu, a freshman who had shoulder surgery last season, and defensive tackle Rocky Savaiigaea (coming off an arm injury) have been cleared, but their roles will likely be limited this spring. Kaneshiro highlights some of the changes that could be made, including Inoke Funaki's move to running back and the use of a tight end in certain situations. McMackin said the Warriors aren't planning significant changes in their schemes on offense or defense, and probably won't work the tight end package into practice until summer. The coaches are looking at using defensive ends Tua Mahaley and Bo Montgomery and backup quarterback Steele Jantz in that role, with them learning one of the slot receiver positions. It will give the coaches the option of putting them in as a receiver or using them as part of the protection scheme. "Now you have this guy in the game who knows the routes," McMackin said. "You see a blitz, now you bring him inside, so it gives you max protection. "I'm thinking it's more of an if-we-need-it type of thing. ... It's a wrinkle, it's something we can go to if we need to." Dave Reardon has a few notes about special teams changes in his Further Review column. Hawaii spring football practice starts Monday. You won't see a lot of special teams, but coach Greg McMackin says the kicking game will get a "complete overhaul." The guy who will do it is new assistant Chris Tormey. He spent some time in Gainesville last week with Florida's and Cincinnati's special teams coaches. "It went really well," Tormey said. "We covered all aspects and I met with their defensive coaches, too." And Stephen Tsai writes about Greg McMackin's plans to honor the academic achievement in Hawaii's public schools. University of Hawai'i football coach Greg McMackin is planning to create a program that will honor the academic accomplishments of sixth-, seventh- and eighth-graders. He is seeking to create an advisory board of teachers, counselors and administrators. Based on the nominations from school counselors, the board will select the "Coach McMackin Academic All-Stars." Each All-Star will receive a T-shirt. What's more, the students, their parents and teachers will be invited to a UH football game this fall. HawaiiAthletics.com has released a PDF of the 2009 Spring Prospectus. It includes a spring practice schedule, spring roster, statistics, notes, trivia, etc., as well as a depth chart heading into practice. Stephen Tsai has excerpted this spring depth chart (he also has a lot of other news and notes), and I will excerpt ST's excerpt here. LWO—Greg Salas; Joe Avery/Rodney Bradley. QB—Greg Alexander; Brent Rausch; Shane Austin. RB—Leon Wright-Jackson; Inoke Funaki; Jayson Rego. KR—Malcolm Lane; Jovonte Taylor; Dustin Blount. UPDATE: I updated my unofficial roster breakdown by class. Crap. Hopefully a blessing in disguise. The Spokane Shock announced today that DL Jonal Saint-Dic has been added to their 2009 roster. In another roster move, the Spokane Shock released WR Jason Rivers. Incoming linebacker George Daily-Lyles has been named the Play It Smart National Student-Athlete of the Month for February. Congratulations to GDL! UH got a great one. Thanks to BleedCrimson.net for the news. Travis LaBoy was recently shorn of his flowing locks, which he donated to "Locks of Love." Turns out both Travis and his wife Nohealani, like so many others, have had cancer affect their family. So they both decide to trim up top for “Locks Of Love,” an organization that collects hair that can be fitted to give to those who have lost their hair because of cancer treatments. Travis cut 11 inches of hair off his head. Nohealani cut 12. Via Revenge of the Birds. UH Athletics has a press release about the upcoming 2nd Annual Warrior Football Coaching Clinic. The article includes a link to a registration form and schedule. Today's Warrior Beat Tsai & Wai Show will feature either David Veikune or Ray Hisatake. Also, there will be no Wai today. 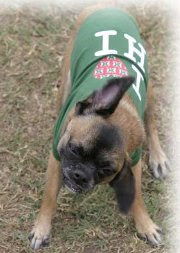 Esme Infante-Nii will be today's co-host with ST. Show starts at noon HST and will be archived on that page afterwards. Be there! Jason Kaneshiro has an article about Samson Satele's move to Oakland. Silver and black suits Samson Satele just fine. The former Hawaii offensive lineman is looking forward to the new color scheme after the Miami Dolphins traded him to the Oakland Raiders. "I wouldn't mind getting back in a black jersey again," said Satele, who wore black during his career with the Warriors. Across the bay, the San Francisco 49ers had their first minicamp of the offseason. Isaac Sopoaga practiced at first-team defensive end and second-team nose tackle. And the Detroit Lions' new head coach Jim Schwartz talked about how the current players, including Ikaika Alama-Francis, will fit into his system. The Lions have some younger defensive linemen who were drafted by the previous administration to fit the Tampa Two: Ikaika Alama-Francis, Andre Fluellen and Landon Cohen. Former coach Rod Marinelli wanted his defensive linemen under 300 pounds. Schwartz wants them bigger. Do they have the potential to fit Schwartz’s scheme? Schwartz said Alama-Francis could play end on running downs and move inside on passing downs. In Australia, where it's already tomorrow, Peter Hanlon of The Age profiles incoming punter Alex Dunnachie. DUNNACHIE readily admits he knew nothing about American football a year ago ("I'm still learning the rules now, trying to anyway"), and went ahead with applying for and being accepted into a health science degree at Latrobe, still thinking this mad adventure couldn't last. It was only when Chapman took the trio to America last month — Dunnachie's first time out of Australia — that he started to believe the possibilities. Flown to Hawaii to meet Warriors' staff, he was asked to give an insight into club-level footy Down Under. "They asked what the biggest crowd was I'd played in front of. I said, 'Maybe 150.' They're like, 'That's 150,000?' I said, 'No, that's 150 people."' When the college season starts in September, he will play in front of 60,000. "It's a bit daunting when you look at it like that." Hope he can make the adjustment quickly. If it makes him feel any better, it'll probably be more like 27,000. And Shawn Withy-Allen threw three TD passes to lead the Fayetteville Guard to victory in their season opener. Thanks again to fuzzylogic. The Miami Dolphins have traded Samson Satele to the Oakland Raiders. Center Samson Satele’s days with the Miami Dolphins are over. The team has traded Satele, a second-round pick in 2007 who started every game the past two seasons for Miami, to the Oakland Raiders, according to two NFL sources. The Dolphins received a sixth-round pick and also will flip picks with the Raiders in another undisclosed round. Horrible team to get traded to, but maybe it's a great opportunity for Samson. Thanks to Garret and fuzzylogic for the news. UPDATE: Stephen Tsai talks to Satele's agent, Leo Goeas. Now, Satele will remain at his preferred position. He is the Raiders' No. 1 center. "Samson is excited about the trade," agent Leo Goeas said. "He wanted to be some place where he would be appreciated. As soon as Jake Grove signed with the Dolphins, the Raiders wanted (Satele) at center." Satele started every regular-season game in 2008 despite a torn labrum in his right (snapping) shoulder. During the postseason surgery, doctors discovered that there was a piece of bone that was broken off from the shoulder. A procedure was performed to correct that tear. Goeas said the surgeries were successful, and Satele will be ready to play. UPDATE 2: The Star-Bulletin has reaction from Satele. Former Hawaii star Samson Satele is looking forward to starting at center for the Oakland Raiders. Satele was traded from the Miami Dolphins — where he played every down last season as the team made it to the playoffs — to the Raiders for a sixth-round pick in next month's draft and a swap of spots in the fourth round. "They went in another direction," Satele told the Star-Bulletin today. "But it worked out good and I can't wait to get to Oakland and start fresh." "I'm happy," Satele told the Warrior Beat. "It's close to home. It's just a hop over the ocean." Stephen Tsai has some updates on Leon Wright-Jackson, Paipai Falemalu and Alema Tachibana. Here's an excerpt on Tachibana, who's been trying to gain weight. "I eat breakfast, lunch, dinner, proteins," Tachibana said. "It's not working." Tachibana, who is 6 feet 2, said he weighs 200 pounds — his playing weight as a Kahuku senior. "I want to get up to 220," said Tachibana, who will compete at defensive end although he might be a better fit physically as an outside linebacker. But the coaches note that Melila Purcell III and Ikaika Alama-Francis both weighed about 205 when they first joined the UH football team. Both filled out, and both are now in the NFL. Jason Kaneshiro talks to Solomon Elimimian and Adam Leonard, who are both preparing for Pro Day. Both are focused on improving their times in the 40-yard dash and various agility drills in advance of Hawaii's pro day April 2 in Carson, Calif.
"I wish it was sooner," Leonard said. "I'm just taking every day to prepare my self and go out there and give my best effort." And former UH QB Shawn Withy-Allen has come out of retirement once again to play for the Fayetteville Guard of the AIFA. Charles Gunnings is blessed with the power of persuasion. Not once, but twice over the past year Gunnings has coaxed Shawn Withy-Allen out of retirement to quarterback the Fayetteville Guard. Gunnings believes bringing Withy-Allen back for a full season in 2009 will be a key element in the Guard rebounding from a 5-9 finish last year that kept them out of the playoffs for the first time in franchise history. Jaguars.com has a profile of Vince Manuwai, who talks about returning from last year's season-ending ACL tear. It’s been six months since he tore the anterior cruciate ligament in that knee. Manuwai has been cleared by doctors to begin the offseason conditioning program, which officially begins on April 6. “Taking it all the way” is player lingo for “milking it.” Manuwai is not going to milk his injury. That’s not his style; never has been. He’s played on a severely torn calf muscle and on a second-degree knee sprain. If Manuwai says he’ll be ready for camp, you can believe him. More importantly, the Jaguars need to believe him because his return is at the heart of the offensive line’s recovery. 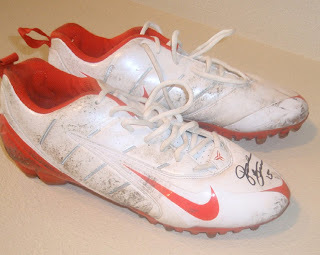 Via 4uhfan on WSN, NFL.com is auctioning off a pair of Davone Bess' game-worn shoes, autographed by the man himself. And Tsaiko djmitcho has some photos of Jason Rivers and Hercules Satele, who both played in their first game for the Spokane Shock of the AF2. Jason Kaneshiro has an update on the yet-to-be-released 2009 WAC football schedule. "They told us that we should have it by the end of the month. That would still work for us," UH athletic director Jim Donovan said. "Most ADs are chomping at the bit to get it so we can make sure we can get our travel arrangements all done and get the travel packages out there for our fans and all those kinds of things. "Even though it is later than usual, it is workable for us." The league is working with ESPN on its television package and having one less weekend than usual to fit the schedule has complicated the process this year. Donovan said the Warriors could make three appearances on national or regional television, although "that's not set in stone." Ferd Lewis writes that the Warriors could play back-to-back road games twice this season. For the first time in its history, the University of Hawai'i football team could play two sets of back-to-back road games in a single season, according to some scenarios under Western Athletic Conference scheduling consideration for 2009. The Warriors already have back-to-back non-conference road games booked Sept. 12 in Seattle against Washington State and Sept. 19 at Nevada-Las Vegas. With a break in between, they could also end up playing, for example, a set of back-to-back conference road games in October. Part of the holdup to date, conference officials said, has been negotiations with ESPN over dates and matchups. The WAC schedule was announced in February last year but the 2009 version might not be announced until next month. "I highly doubt it will be before the end of (this) month," Hurd said. Kaneshiro writes about new graduate assistant Mike Smith, season ticket sales and the Super Games. "It brings us together a lot," said defensive tackle Rocky Savaiigaea, one of the 10 captains assigned to lead a team. "We work so hard during the week with individual drills, it's a good chance one day out of the week we can come together and mix it up and we just have fun with it." With the games complete, the Warriors are looking forward to the start of spring practice on March 30. "These guys have worked out harder than any group I've been around since I've been here as far as the offseason," McMackin said. "This is a group that really is hungry." Leila Wai interviewed Greg McMackin about the Super Games today. As a bonus, he previewed the Warriors' new white road pants, which includes tapa patterns on the legs. Coach Mack says the team will still use both the black and green pants. Here's a link to the Honolulu Advertiser's video page. The vid is also embedded below. Jason Kaneshiro will be taking over the football side of the UH Sports Extra blog, according to Dave Reardon. Kaneshiro's first post is about the final event of this year's Super Games. The Warriors will try to channel their inner Kolten Wong in the final event of this year’s Super Games competition Wednesday morning.They won’t exactly be swinging from home plate (they’ll move up considerably closer to big blue), but tomorrow morning’s home run derby at Murakami Stadium figures to decide a close race for the overall title and, more so, bragging rights. The post also reminds me that spring practice is just two weeks away! Via 4uhfan on WSN, Chargers.com has a profile of former UH offensive lineman Kynan Forney, who just re-signed with San Diego and is looking to play more this year. Forney signed with the Chargers last September after being released by the Falcons at the end of the preseason. He was active for just three games last season and didn’t see any playing time during his first campaign in San Diego. Watching from the sideline wasn’t something Forney was used to. He earned a starting job with the Falcons as a rookie in 2001 and was a fixture in Atlanta’s offensive line for each of his seven seasons with the club. The 2008 season tested his patience at times. Forney claims that he feels better than he has in years. In retrospect, he’s thankful for the chance to let his body heal and is hopeful that the down year will trigger a revival of his career. And the Miami Dolphins have set up a private workout with David Veikune. The Dolphins -- who scouted receivers Hakeem Nicks and Brandon Tate at North Carolina's Pro Day on Tuesday -- booked private out-of-town workouts with several prospects they like, including outside linebackers Connor Barwin (in Cincinnati earlier this week) and David Veikune (Hawaii), receiver Brian Robiskie (Ohio State), Texas Tech guard Louis Vasquez (Wednesday) and one of the draft's top punters (Cincinnati's Kevin Huber). This article from the SJSU Athletics website takes a look at the 2009 WAC conference schedule and why it hasn't been released yet. During meetings and conversations at the recently-completed WAC Basketball Tournament in Reno, commissioner Karl Benson informed university officials and media members that there are unique challenges to completing the 2009 conference schedule for the nine members. This year, there are only 14 Saturdays in September, October, November and the first weekend in December to complete the regular season versus 15 in 2008. At least one WAC school is interested in taking advantage of playing a 13th regular season game. On the surface, that may not impact those like San Jose State as much playing 12 games, but a school playing 13 games can have only one bye week. Unlike San Jose State, which has all its non-conference games at the beginning of the season, there is at least one WAC member with at least one non-conference game in the second half of the season. Scheduling games with the least number of variables is most desirable. SJSU implying something, hmmm? Anyway, Ferd Lewis wrote a column three weeks ago about the delay and some of the other issues the WAC may be dealing with. The Western Athletic Conference football schedule for 2009 is running a little late and the University of Hawai'i is waiting more anxiously than usual. Indeed, the Warriors are crossing their collective fingers the WAC will give them either an open date or a home game for the Sept. 26 slot that follows back-to-back non-conference road games in order to avoid what would be an unprecedented three consecutive games on the Mainland. It is a fair enough request given UH's geographic issues and one you'd like to see the WAC honor. Under the WAC's TV contract, ESPN first selects the games it wants and works out the dates with the conference. For example, two years ago ESPN chose to have the UH-Boise State showdown placed on Nov. 23, the penultimate weekend of the regular season. Then, the rest of the conference schedule is assembled and, generally, released by mid-February. But ESPN, which was to have made its selections by Feb. 1, has yet to do so, WAC officials said. Hopefully ESPN has made their selections. And maybe they have. Stephen Tsai had some comments in the Warrior Beat last Friday. I heard a tentative WAC schedule is being circulated. Apparently UH will have several ESPN/ESPN2 appearances. I think UH will avoid the three-games-in-a-row scenario. But the Warriors might have to have a second back-to-back situation. We'll see. KGMB'z Liz Chun has video of the Warriors playing water polo as part of the "Super Games." Alasi Toilolo gets tackled into the pool while being interviewed. Dave Aranda, Greg McMackin and Greg Salas are also interviewed. Thanks to fuzzylogic. Stephen Tsai writes that linebacker Tim Brown will join UH as a walk-on. Earlier, Tsai wrote that Earvin Sione may be rejoining UH as a walk-on. According to uhwarrior23 on SportsHawaii.com, there could be a scheduling announcement in the near future. During halftime of the Wahine Basketball game, Jim Donovan told Bobby Curran that he will be announcing a home and home w/ a team sometime in the next week or two. He said UH fans will be very pleased. Wonder who it is? hawiian50 points out that David Veikune's NFL Combine highlight video is up on NFL.com. There's also some short videos for Ryan Mouton and Jake Ingram. Veikune is ranked at #46 on SI.com's Top 50 draft prospects big board. He's also listed at #59 in National Football Post's mock draft on Yahoo.com. Tsai has some notes from Greg McMackin's Warrior Beat chat from Tuesday. There's also a thread on WSN discussing what was said. Video coordinator Ryan Biesemeyer is leaving UH. Blaze Soares probably won't participate in spring practice, but hopes to be ready for fall. This year's Boise State-UH matchup may be the last one on the WAC's yet-to-be-released regular season schedule. Former UH safety Leonard Peters models some clothes. Apparently, Fauna Collection has a line of UH doggie shirts. There's more stuff at UH Rainbowtique. 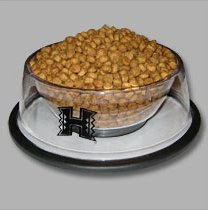 I don't have a pet, but I think I found my new cereal bowl. HawaiiAthletics.com has an article publicizing their new social networking pages. In order to broaden our reach to our fans worldwide, the University of Hawai'i Athletics Department has entered the world of social networking with the launch of Facebook, Twitter, and YouTube pages. Our Facebook and Twitter accounts will feature up-to-the-minute posts about our 19 intercollegiate sports programs. All of our video content featured on our website HawaiiAthletics.com, including the popular "H-Files" and "Coaches Corner" segments, will be posted on our YouTube channel and on Facebook. Our Facebook page will also feature photo galleries. Twitter users will receive score updates, promotional activities, press releases and recaps. From their Facebook page, here's a "Coaches' Corner" video profile of offensive line coach Gordy Shaw. Coach Greg McMackin will be today's guest on the Tsai & Wai Warrior Beat Disco Dance Party today at noon HST. You can ask questions at the regular Warrior Beat, or during the show on the window thing. They'll replay it if you miss it. Be there! 2009 Coaching Clinic, Spring Schedule, Upcoming Events, Etc. The UH Athletics Department now has its own Youtube page, which they launched yesterday. Woot woot! Great to see them doing stuff like this. Below is a "Coaches' Corner" interview with new UH football assistant coach Chris Tormey. P.S. They also have a Twitter page. Stephen Tsai has posted the spring practice schedule. Monday, March 30 — 7 a.m.
Wednesday, April 1 — 7 a.m.
Saturday, April 4 — 7 a.m.
Monday, April 6 — 7 a.m.
Wednesday, April 8 — 7 a.m.
Thursday, April 9 — 7 a.m.
Monday, April 13 — 7 a.m.
Wednesday, April 15 — 7 a.m.
Thursday, April 16 — 7 a.m.
Monday, April 20 — 7 a.m.
Wednesday, April 22 — 7 a.m.
Thursday, April 23 — 7 a.m.
And Ferd Lewis gives the Mountain West Conference what for. Not a peep was heard two seasons ago when unbeaten Boise State was left high and dry in the title picture. Nor, you suspect, would the MWC have uttered a word had it been, say, Tulsa or Ball State that got ripped off this past season. Make no mistake about it, the BCS needs to be overhauled. There should be genuine debate and serious solutions toward a football version of the NCAA basketball tournaments. To that extent the MWC proposal is welcome. But what isn't needed are more self-aggrandizing grabs by individual conferences. That's what created the situation we have now. Of course, it helps to remember that the MWC was created by the schools that clandestinely chose to bolt the WAC and hijacked the TV contract on the way out the door. Jake Ingram will be today's guest on the Tsai & Wai Show at noon. The replay should be up afterwards. Samson Satele has competition in Miami. Timmy Chang was released by the Winnipeg Blue Bombers last week. The Hawaii Football School Blog has pictures of Colt Brennan helping out over the weekend. And thanks to Evan, who notes that Gerard Lewis is on the roster of the AF2's Amarillo Dusters along with fellow former UH corner Myron Newberry. Via WarriorSportsNetwork and SportsHawaii.com, are these three 2009 commits enrolling at Arizona Western instead of UH? They're listed on NJCAA.org as letter-of-intent signees. UPDATE: However, PIAA DS clarifies the situation on the SportsHawaii thread, and there is hope at least Chad and Benson may still be Warriors in the fall. For both Benson and Chad, its their back up plan. Both are continuing to take the SAT's , taking a few extra classes through BYU and hope to qualify on time for fall. However, if they dont, AzWestern has commited to give them full scholarships, which the families need. If Benson and Chad didnt commit now, and come June they decided to go that route, AzWestern (and all other scholarship JC programs would be out of scholarships) this way the schools will hold them for these two excellent players. Stephen Tsai writes that John Estes has been named to the Rotary Lombardi Preliminary Watch List. This is the second year on this list for Estes. Tsai also has some pics and a few notes about personnel moves. Yes, it's true: Kealoha Pilares and Jake Heun are on the move. Pilares is moving back to slotback; Heun is going to be an outside linebacker/rush end. He also wrote on Saturday that incoming running back John Lister will grayshirt. Dave Reardon has a column about Greg McMackin and Jim Donovan's trip to Japan. For your typical football fan, annual visits to American Samoa make sense. Plenty of potential future Warriors there. Also, the joint venture last year with June Jones' SMU staff doubled as a medical mission, so who can argue with that? And Australia appears to be the cradle of UH punters. Jones shared Donovan's longtime vision of an Asia full of Warrior fans and made some visits to Japan to spread the gospel. He got Fresno State coach Pat Hill on board, too, even talking about a game there. McMackin said his eyes were opened when he was with the 49ers and Masafumi Kawaguchi drew a throng of Japanese media in brief summer camp stints. And Ferd Lewis has a column on the "land mines" former UH athletic director Herman Frazier left behind. Between the athletic department deficit, controversy surrounding women's basketball coach Jim Bolla, the struggles of the men's basketball team and June Jones' departure, Frazier's impact is still being felt. The school's Board of Regents were told of a $5.4 million accumulated deficit in the athletic department by an independent auditor, almost all of it acquired on Frazier's watch. Prior to his arrival in 2002, the athletic department had run at a surplus for at least six of the previous seven years. Frazier's inability to run a solvent program, much less put away anything for a rainy day, has come back to haunt UH in these austere times.